Mack Trucks displayed its second-generation zero-emission capable Class 8 drayage truck at the California Air Resources Board Low Carbon Transportation Heavy-Duty Showcase in Sacramento, Calif. The plug-in hybrid electric (PHEV) truck has been operating in revenue service with a customer drayage fleet for more than 12 months. Mack Trucks displayed its second-generation zero-emission capable Class 8 drayage truck at the California Air Resources Board (CARB) Low Carbon Transportation Heavy-Duty Showcase in Sacramento, Calif. The plug-in hybrid electric (PHEV) truck, which is based on a Mack Pinnacle axle back daycab, has been operating in revenue service with a customer drayage fleet for more than 12 months. "Mack Trucks has been a powertrain innovator for more than a century, and we're proud to showcase our current and developmental technologies to help reduce emissions," said Jonathan Randall, Mack Trucks senior vice president, North American sales and marketing. "Testing of this truck has allowed us to validate the emission reduction potential of the PHEV technology in combination with self-learning algorithms to control electric operation. We look forward to continuing real-world testing, as well as collaborating with CARB, SCAQMD and others." The truck is being tested as part of a $23.6 million project led by the South Coast Air Quality Management District (SCAQMD). The goals of the project include reducing pollution and greenhouse gas emissions at locations with heavy freight volumes, including ports, rail yards and the freight corridors connecting them. The truck is an evolution of the first Mack PHEV drayage truck, which was built as part of an earlier SCAQMD-sponsored project and displayed during Advanced Clean Transportation (ACT) Expo 2016. 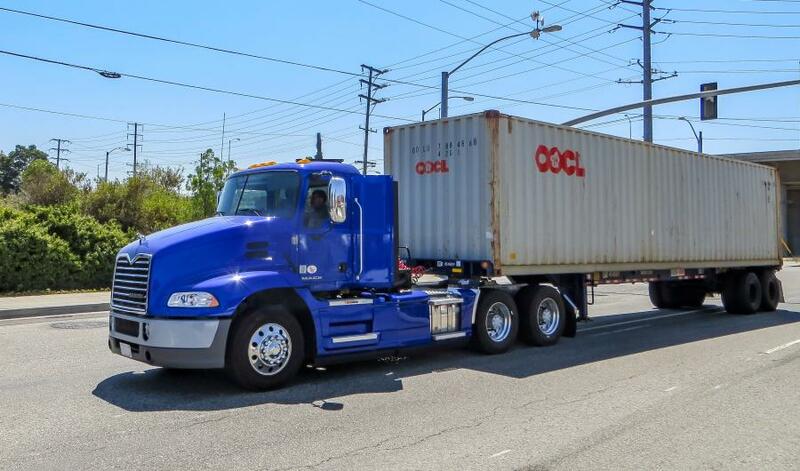 That truck underwent more than six months of successful testing in a customer drayage fleet at the Ports of Long Beach and Los Angeles. Similar to the first-generation truck, the second-generation PHEV drayage truck is capable of zero-emission operation due to the integration of a Mack MP7 diesel engine with a parallel hybrid system and lithium-ion battery pack. Unlike the first-generation truck, which utilized geo-fencing capabilities similar to those enabled by Mack's GuardDog Connect telematics platform to switch between zero-emission and hybrid operating modes, the second generation truck relies on an adaptive self-learning algorithm to identify and create zero-emission zones in order to maximize all-electric operation. During normal operation, the truck records the load, speed, and power and torque demand, analyzes that data and combines it with GPS location information to identify, create and store in its memory zones where the electric driveline is capable of operating in zero-emission mode. The truck learns from its operating patterns and, on subsequent trips through these zones, the truck automatically switches from hybrid operation to zero-emission operation. The driver also can use a button in the dash to manually override the mode selection if needed. This self-learning approach has enabled the second-generation truck to operate in zero-emission mode more than twice as much as the first-generation truck, which relied solely on preset geo-fences, according to the manufacturer. The dramatic increase in all-electric range was achieved with no changes to battery pack size or capacity, or truck performance.